Wabi-Sabi: Jake and Jonah are Twins? Jake and Jonah are Twins? 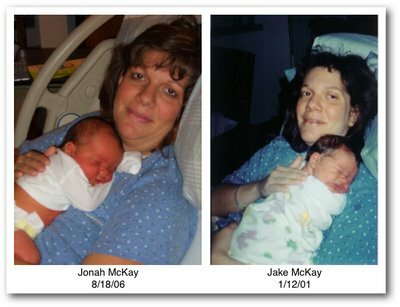 Carol was looking at some pictures of Jonah and wondered why a picture of Jake was saved alongside Jonah’s pictures from the hospital. Turns out that the picture was Jonah after all. It just looked almost identical to one her favorite pictures from when Jake was born. As an identical twin myself, it’s pretty cool to see the similarities. It’s also clear that I should have bought Carol a new nursing nightgown sometime in the past 5 years.